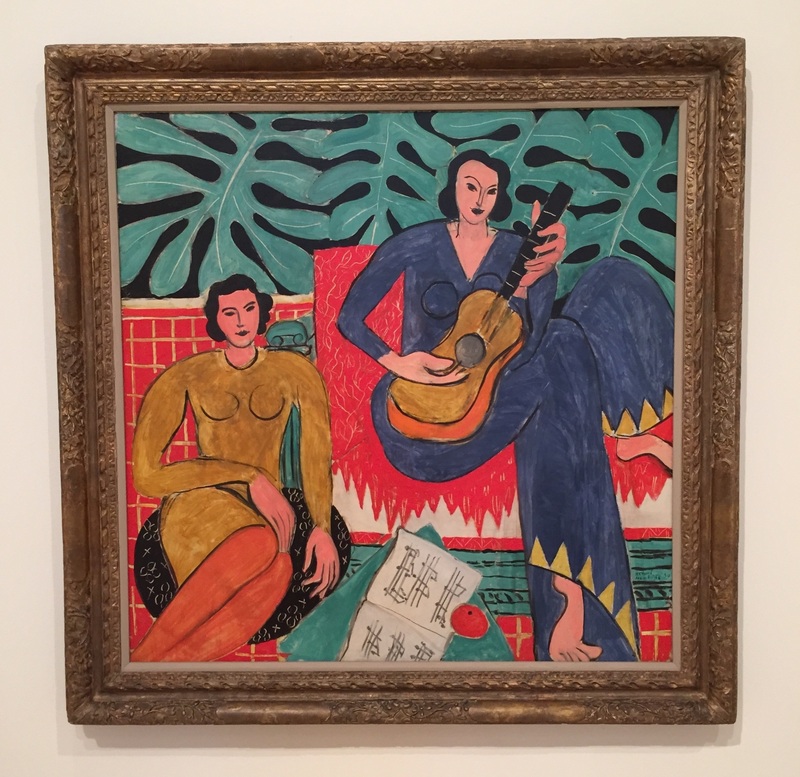 Matisse’s colorful “La Musique” is featured in the exhibition Van Gogh to Pollock: Modern Rebels. Come check it out! Photo by the author. “If I were not making the paintings I make, I would paint like Matisse,” Pablo Picasso once said of his rival and dear friend, Henri Matisse. Both artists are featured in the Milwaukee Art Museum’s latest exhibition, Van Gogh to Pollock: Modern Rebels. In the early twentieth century, the relationship between Picasso and Matisse had developed out of a nature of competitiveness and grew to be one of mutual admiration—at times. When Picasso came onto the European modern art scene, Matisse, being eleven years older, had already established himself as a rebel in that world. After meeting in 1906 at the Parisian salon of famous writer Gertrude Stein, the two artists would continuously look to one another’s work to both pose criticism and find inspiration. Henri Matisse (French, 1869–1954) was a simple man of habit and aimed to make his art calming and harmonious. Before becoming a full-time artist, he attended school to study law; it was not until he was 22 that he decided to pursue a career in art. He developed the artistic style of Fauvism, named after an art critic who labeled Matisse and his followers “les fauves,” or “wild beasts.” At the time, Fauvism was the ultimate rejection of traditional artistic styles, which spurred much controversy. Though slow to start, Matisse thrived in the European avant-garde art scene. In terms of personality, Pablo Picasso (Spanish, 1881–1973) was very different from Matisse. Picasso lived a bohemian lifestyle and was known to be outspoken. He showed artistic talent at a young age, and was taught by his father, who was a painter. In his early training, Picasso copied great artists of the past, but soon became frustrated as he desired something new and different. Picasso was only 19 when he moved to Paris to begin his art career. It was there that he pioneered the Cubist movement. You will also find a work by Picasso (and, no, it is not Cubist) titled “La Toilette.” Photo by the author. 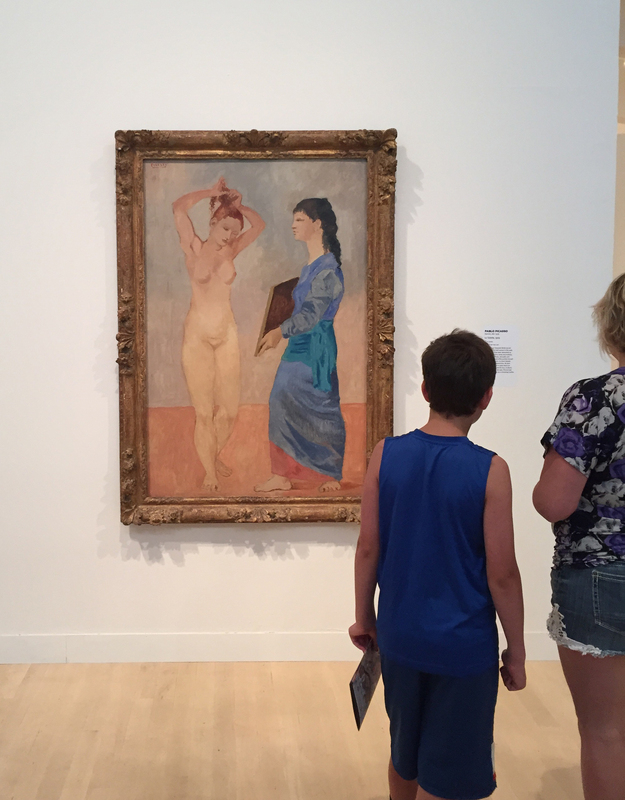 At the time of their meeting, Picasso had seen some of Matisse’s works, including Le Bonheur de Vivre, which had challenged all conventions of representation. Picasso saw Matisse’s use of brightly colored pigments and visible brush strokes as refreshing, but also as competition for his own developing career; he challenged himself to make something even more groundbreaking. Not long after that, Picasso began his famous Les Demoiselles d’Avignon, which would further shatter everyone’s notions of representation. However, though constantly trying to top one another, Picasso and Matisse were both known to admire works by late-nineteenth-century Post-Impressionist Paul Cézanne (French, 1839–1906), and drew from his use of bright colors and breakdown of form. Picasso and Matisse would often visit each other in their studios to give comments on each other’s latest projects and discuss (argue) art in general. They even occasionally exchanged works. Matisse was known to have given Picasso a painting of Matisse’s daughter titled Portrait of Marguerite. Although it is rumored that Picasso and his friends threw darts at this particular work, he kept it throughout his life; today it remains in Picasso’s collection in the Musée Picasso in Paris. However different they might have been in personality and artistic style, it is fair to conclude that Matisse and Picasso grew in their careers due to the relationship they had. That is not to say that both careers were completely based on this friendly competition, but it certainly did not hurt to have that extra criticism, that extra push to be more creative. Today, we can see that it was both artists, along with many others, who collectively carried the world into this new era of modern art. This entry was posted in Art, Curatorial and tagged 20th century art, European art, Henri Matisse, Modern art, Modern Rebels, Pablo Picasso. Bookmark the permalink.